SCARBOROUGH—Gorhamite Mackenzie Holmes led all scorers with 22 when the Rams dropped in on the Storm on Thursday evening, Jan. 10. Alas, Holmes’s teammates couldn’t quite manage their usual level of production and the squad as a whole turned the ball over much too frequently to eke out a win: Scarborough emerged triumphant in the end, 44-36. Scarborough – who’ve spent the past five weeks assembling an exceptional season – looked uncharacteristically one-note to open the outing. The team’s first 18 points came on six threes; they simply struggled to penetrate Gorham’s defense, and never added their first two until near the end of the uphill half. Meanwhile, Gorham knocked down a number of routine buckets inside – the first couple by Jacqui Hamilton and the next three by Holmes. After one quarter, the Storm stood on top 12-10. Scarborough outpaced the Rams again the second, but again just by two points, for a 20-16 lead at the break. The Storm began the push with Jocelyn Couture and Julia Freeman threes for an 18-12 upper-hand, but Holmes knocked down a pair of twos to keep her girls close at 18-16. Then Kayla Conley kicked in a Storm buzzer-beater for 20-16 and the lion’s share of the momentum heading into the break. 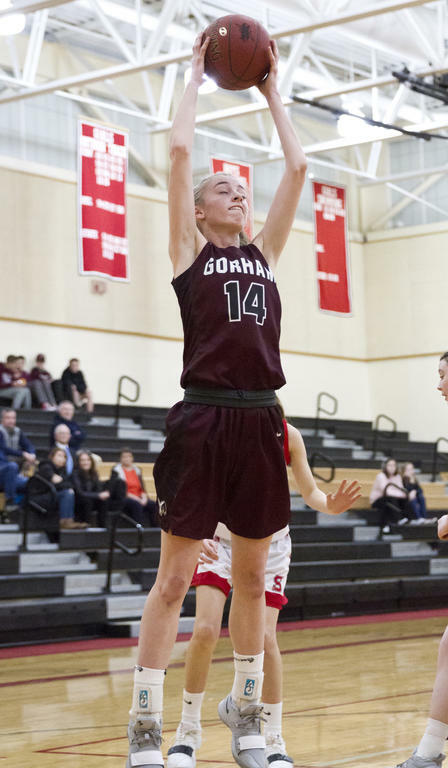 Gorham’s relative youth – and their need to develop further chemistry, a need they’ll only meet with time – are the obvious reasons they haven’t quite synched up into a quintet that adequately protects the ball. In the third, Scarborough finally figured out how to get inside on the Rams, opening the stretch with two frees from Bella Dickinson as well as four points by Couture and a pair of twos by Freeman. Midway through the quarter, the Storm held a 30-19 lead; despite Holmes’s best efforts – which included a steal she parlayed into a layup – Scarborough maintained their 11-point advantage heading into the fourth. 36-25. Gorham won the final quarter, but not by nearly enough: The Rams outpaced their hosts 11-8 in the last eight minutes, setting the scoreboard at 44-36 in the end. Gorham stumbled at the outset of last season, only to – as every coach hopes his or her team will do – play their best ball late in the season. The Rams ultimately lost an epic state final by the narrowest of margins to Edward Little. Beyond Holmes’s 22, Hamilton finished with six for the Rams, Courtney Brent and Sarah Walker with three each and Adele Nadeau with two. Freeman collected 14 total for the Storm, Couture 11, Conley eight, Dickinson five and Madison Blanche and Lindsey Fiorillo three apiece. Gorham, currently 7-3 and ranked third in AA South, fell to the Storm (10-1, second in AA South) earlier in the season as well. The Rams’ other loss came against Greely (No. 1 in A South, 11-0). The team picked up a 67-45 win over Lewiston (seventh in AA North, 3-7) on Saturday the 12th. They host Oxford Hills (No. 1 in AA North, 9-2) on Tuesday the 15th, then travel to TA (seventh in AA South, 2-9) three days later. South Portland sits atop the AA South standings at present, at 9-1. Greely is the only team to beat the Riots to this point; the Rangers earned that victory 66-50 back on Dec. 14. Adele Nadeau reels in a rebound for the Rams. Mackenzie Holmes gets air over a pair of Scarborough opponents. Courtney Brent surveys her options along the sideline. Lauren Fotter lofts up a shot for the Rams. Brittany Desjardins thrashes through heavy Storm coverage.